A little history: I was supposed to be a part of this (or any of the other bundles in the Buqo YA books), but I sucked at time management back when the class was ongoing and I totally wasn’t able to focus and write. I did get a new job by then, plus it was Papal Visit week. Granted, I was two chapters away from finishing my story by the last day of the class, but I realized that I didn’t want to turn what I had in because it was far from publishable form, and I had zero time to edit after the class ended because life, and work. So I let my story rest (and it’s still resting). But that doesn’t mean I don’t get to support my fellow authors, right? So, Taking Chances is the first Buqo YA bundle. 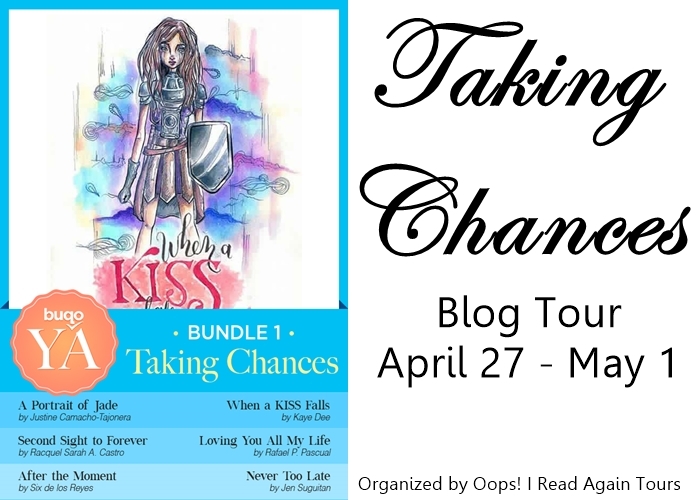 Each bundle contains six stories, and the stories in this book are all about what the title says: taking chances. The stories are short and sweet, because they’re all romance, and they’re all set in the Philippines, so yay, because we can never have enough of Filipino YA novels/short stories, right? Of all the stories in this bundle, three are my favorite: Justine Camacho-Tajonera’s A Portrait of Jade, Six de los Reyes’ After the Moment, and Jen Suguitan’s Never Too Late. A Portrait of Jade is about Jade who goes to an art camp in Baguio to escape being under her sister’s shadow. She meets Alex, a snotty art boy who criticizes her work, and they get paired up with their final project for the camp. I liked the whole concept of the camp, and how the two worked on the projects. It was really sweet and interesting, and Jade’s growth at the end was a pleasure to read. Check out the other blog tour stops here!